Spain’s Socialist party government on Friday called off talks on Catalonia’s future with pro-independence leaders of Catalonia’s Generalitat regional leadership. The decision came just days after a government offer of all-party talks chaired by an independent moderator was met with the Catalans’ insistence that such talks’ final goal must be to permit a referendum on Catalan independence from Spain, which previously has been declared unconstitutional by Spain’s Constitutional Court. The idea of all-party talks outside Catalonia’s parliament chaired by an independent relator sparked a firestorm of criticism from parties on the political right and internal division in the Socialist party of President Pedro Sánchez, with regional ‘barons’ and historic party leaders criticizing the plan. The Sánchez government’s offer appeared to be a gesture to the Catalans that the government was willing to take the political risk of an all-party mesa de dialogo format chaired by an independent moderator, if the Catalan pro-independence parties were willing to withdraw opposition and support the government’s 2019 federal budget slated for a vote this week. Both the ERC (Esquerra Republicana de Catalunya) and PDeCAT (Partit Demòcrata Europeu Català) parties have said they will vote against the budget, which if defeated would make it all but impossible for the Socialists to fund social-spending targets and will likely pave the way for early elections. The conservative Partido Popular, centre-right Ciudadanos and ultra-right Vox parties jointly scheduled a large rally for Sunday in Madrid to protest the talks and attack the Sánchez government. But, what brought the government initiative to a screeching halt on Friday was the Catalan’s insistence that the raison d’etre of such talks must be establishment of a binding referendum of self-determination that if passed by Catalan voters would allow the region to secede from Spain. The government had given the Catalans a deadline for removing the referendum language from their proposal and showing a willingness to back the 2019 budget, but met with no response. 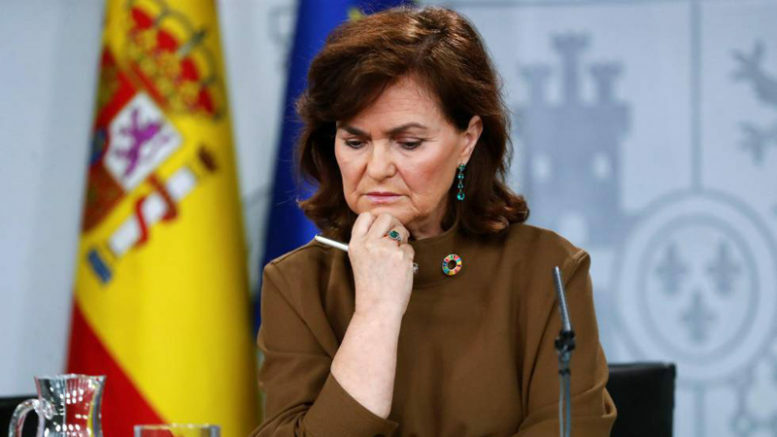 Minutes before the government’s regular press conference following every Friday’s Council of Ministers meeting, Vice-President Carmen Calvo sent a final WhatsApp message to her Catalan counterparts: “It had to be now. I understand this to be a ‘No’. Good luck.” Moments later, she announced the talks were off. Sunday’s much-touted demonstration by right-wing parties in Madrid brought out 47,000 supporters from across Spain, a show of growing dissatisfaction with the government’s handling of the Catalan issue but still a far cry from the size of previous political rallies staged in the capital city by the Partido Popular.